I wanted to share with you some info on Honey and Honey Bees. My Brother-in-law and Sister-in-Law own and operate D's B's in Peshtigo, WI - which is about 1 hour north of Green Bay. Dave & Darla are regulars at their local Farmer's Market - selling honey. We laughed because Dave says few know his name everyone calls him the Bee Man. During our visit Dave & Darla were telling us some amazing facts about bees. 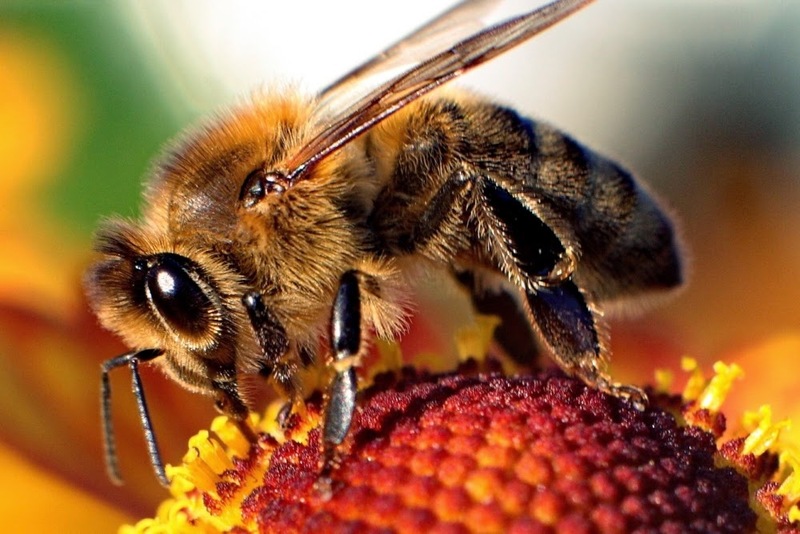 * Without Honey Bees - crops would be reduced and some crops would not yield at all. * California, Florida, Minnesota, Montana and North & South Dakota are the leading honey producing states. * Bee keepers often migrate their bee hives to provide pollination services to farmers across the USA. * Honey Bees are the only insect that produces a food consumed by humans. * Honey is considered one of the most versatile ingredient on the market today. For sauces, marinades and salad dressings, substitute pure honey for up to half the granulated sweetener in a recipe. 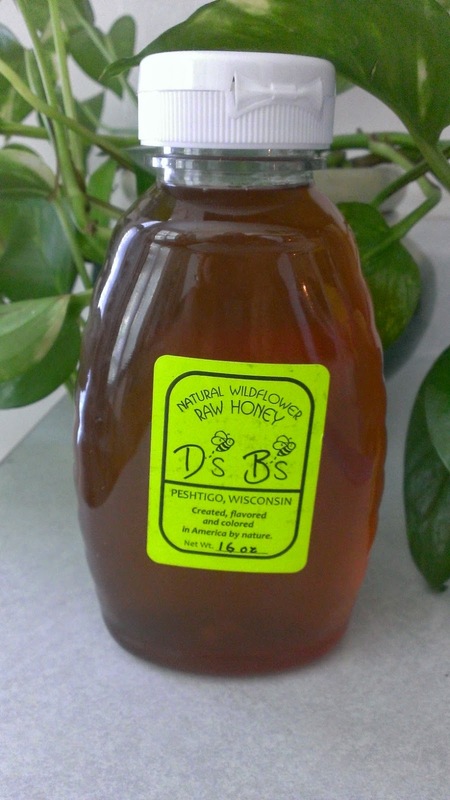 If you are interested in purchasing D's B's Natural Raw & Unfiltered Honey give them a call at 715-596-0024 ~ the Bee Man will gladly ship his tasty natural honey to all locations in the USA. Amazing benefits of using honey. Make sure to check out the National Honey Board website for more amazing info on honey. We are huge honey fans in this home. My great grandfather lived to be almost 100 and still active when he passed. He always gave credit to honey. He would have two pieces of bread with every meal and add honey. I am so into honey. My aunt and uncle have hives. Love it when we get fresh honey from them. We use raw honey for so many things and it's so very good for you too! WE had a bee hive in our back yard that a neighbor was keeping. we got some fresh honey it is amazing. That picture of the bee kind of freaks me out since I got stung but I do love honey! Sounds really nice. I buy our honey local too. I use it in my tea. I love bees and I wish people were more conscious about preserving them. Far too many people take them for granted. This is a very informative post. I was unaware of mostly all of the things that you mentioned. However, I am terrified of bees. I like the bee trivia you included. I had no idea that Montana was a leading producer of honey! Very interesting facts. I also use Ds Bs honey for medicinal purposes. One of my children recently did a school report on bees and I know so much about them now. It does give one a better appreciation for honey. Honey is such a fabulous product with so many uses. I use local honey to boost my resistance to allergies. We are firm believers in all things honey! Great post! I never knew the conversion for using honey instead of sugar, that is going to come in handy. My dad used to raise bees, and we used to harvest our own honey years ago. Honey seems to be making a big comeback lately - as it should with the issue of colonies dying and the fact if bees go, so does the entire food chain. Looks like a good product. We love honey! It's so expensive around here so we don't have it as often as we'd like but we get it when we can. That honey pictured looks great! I have a local honey farm near me! Fresh honey is the best ever! I love honey! We always pick up fresh honey when we go to our vacation home in the mountains! Thanks for the great information. I love to put honey in my hot tea. I wish I had known last week that honey was a cough suppressant I needed some. I can't even eat biscuits without honey. I absolutely LOVE honey, love, love, love it. It's so cool that your family members produce it! We're all honey fans in my house. Biscuits with honey, honey on toast, honey on peanut butter sandwiches, honey in tea- it goes with everything! We also use local honey for allergies. That's a lot of honey facts! I'm a sucker for fresh honey! We love honey! We always purchase local honey to help our local farmers. I had no idea honey had so many properties. I knew it was delicious, but I didn't know about most of the other. Thanks for the interesting read! I love honey. I didn't know all of the benefits of honey though. Thank you for all the great tips. We love us some honey. We have a great company here in MI that has some awesome raw honey that I use in my tea during the winter. Once in a while I drizzle it on my peanut butter toast with a banana. I like the idea of using honey for a natural sweetener. Honey is so welcome in a teaspoon of tea sometimes too. My daughter and I love using raw honey. We put it in our tea, and use it as a way of helping with our allergies! I wish more people knew how important bees are! I love real honey like this! I love honey! Thanks for all the info! We are big honey fans! Our favorite is local honey as it's helpful for our allergies too! I pretty much have a honey addiction. Thanks for all of the info. My husband and I just watched a you tube video about how bees making honey with the kids. We all learned something that day. Very cool little creatures.